While deep belly fat has long been associated with poor cardiovascular health and diabetes, researchers have recently indicated that it is also a risk factor for bone loss and reduced bone strength—in men. Until recently, men—especially obese men—were thought to be relatively protected against bone loss. But, not all fat is the same. Subcutaneous fat lies just below the skin, and visceral or intra-abdominal fat (what we call deep belly fat) is located deep under the muscle tissue in the abdominal cavity. This type of deep belly fat is also known as a beer belly. Genetics, diet, and exercise are all contributors to the level of visceral fat that is stored in the body. Excess visceral fat is considered particularly dangerous, because in previous studies, it has been associated with increased risk for heart disease. A recent study was commissioned to determine the risk factors for osteoporosis in men. To many people’s surprise, it found that male obesity was linked with fracture risk. A follow-up study examined how deep belly fat impacted bone strength. Researchers in Massachusetts evaluated 35 obese men with an average age of 34, and an average body mass index of 36.5. They used specific types of CT scans to determine how much force would be necessary to fracture a bone. They found that men with higher visceral and total abdominal fat had lower “failure load” and “stiffness,” two primary measures of bone strength. The study showed that abdominal and particularly visceral fat take a significant toll on bone strength. Those with a lot of deep belly fat had far worse bone strength than obese men with less belly fat (but equal body mass index). This finding helps show that osteoporosis is everyone’s problem, not just women’s, and it added yet another item to the long list of dangers associated with obesity. While the best method to get rid of any fat is to exercise and burn off more calories than you take in, the process can also be accelerated by eating a diet rich in fiber. 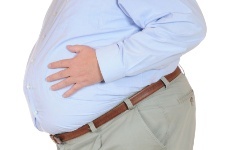 “Men with belly fat at risk for osteoporosis,” Radiological Society of North America, November 28, 2012.